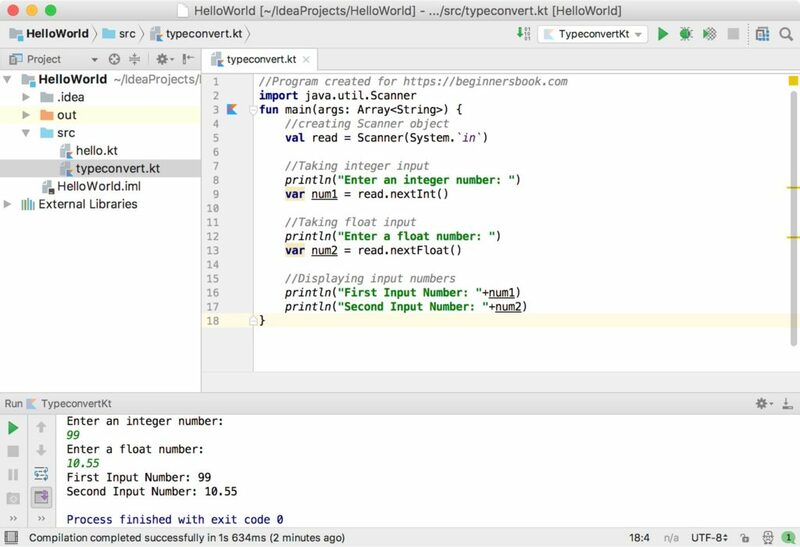 In this tutorial, we will see how to take input from user in Kotlin. In this example, we will take the input from user and display it in the output. Here we are using readLine() function to read the string entered on console. As we have seen in the above example that the readLine() function reads the input as a String. If we want to take the input in a different type such as integer, long, double then we need to either explicitly convert the input to another type or use the java Scanner class. Here we are explicitly converting the input to an integer number. In this example we are taking the input as an integer and float using the nextInt() and nextFloat() functions respectively. Similarly we can use nextLong(), nextDouble() and nextBoolean() methods to take long, double and boolean inputs respectively.